A DIY Victorian conservatory is guaranteed to add style, comfort and value to your home. *You have the option to upgrade to self-cleaning solar control glass in the frames and doors too. And our Victorian style conservatories are totally adaptable to any building shape – even if you live in a bungalow, or have other height restrictions, we craft your conservatory so it fits perfectly. The DIY Victorian conservatory is multi-faceted – giving it that eloquent British identity. Each of our extensions are made-to-measure, meaning all the measurements will line up with your property, ensuring easy installation. And you can choose which type of glass you would like, as well as your preferred style of door, frames and roof. We want you to be 100% satisfied with your Victorian conservatory – so we’re willing to go the extra mile to ensure you get what you need. For more information about Victorian conservatories (plus many other styles), order your free Conservatory Land brochure. The Victorian conservatory naturally has a classic, British-inspired design. But there are a few different styles for you to choose from, based on your own personal preference – all of which come with a bespoke Victorian conservatory roof. If you give us a call, we can speak to you about what you want, and come up with a Victorian conservatory plan. Many people think they don’t have the necessary room for an extension – but rest assured, we can provide you with a small Victorian conservatory – no problem. A Victorian conservatory can cost as little as £2,495. However, it depends on your required size, and other specifications you might have. Because this is a DIY project, our customers are already saving money on construction costs. Below, you can see a series of Victorian conservatory images that highlight how amazing they look. Many of these pictures were taken by our customers, of projects they completed themselves. To get your Victorian conservatory quote for free, you just need to order your brochure. Once you’ve completed the form, you choose your model, style and colour. Then you just need to enter some estimated measurements and submit the form. We’ll assess your information and respond to you with a quote. 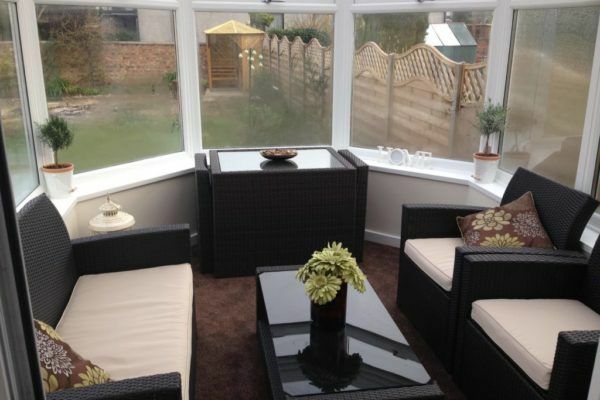 We tailor-make every single part of your conservatory – so it’s 100% guaranteed to fit against your home. That’s why your measurement details are required. The more information you provide, the more accurate your initial quote will be. If you decide to go ahead and buy your Victorian conservatory, our designers get to work straightaway. You’ll also get a technical advisor – who walks you through every step of the project. You can even call them when building your Victorian conservatory, just to make sure you’re going about it the right way. All your parts are delivered as large, easy-to-fit pieces (no small fiddly bits). They’re numbered too -meaning you can follow the instruction manual with ease. Our Victorian conservatories are all guaranteed for 10 years and our ConservaBase option for 10 Years – so you’re getting the highest quality DIY conservatory model on the market.